As I've been getting back into the newly re-branded 'Middle-Earth Strategy Battle Game', I've been digging out all my old LOTR miniatures and really enjoying getting them ready to play with. 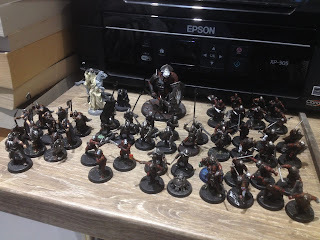 While doing this I began contemplating starting a Hobbit-era force and my first thought was to do a 'Dark Powers of Dol Guldur' army as it would be fairly small, I love the Nazgul, and I'd get to use the Necromancer miniature I already own. 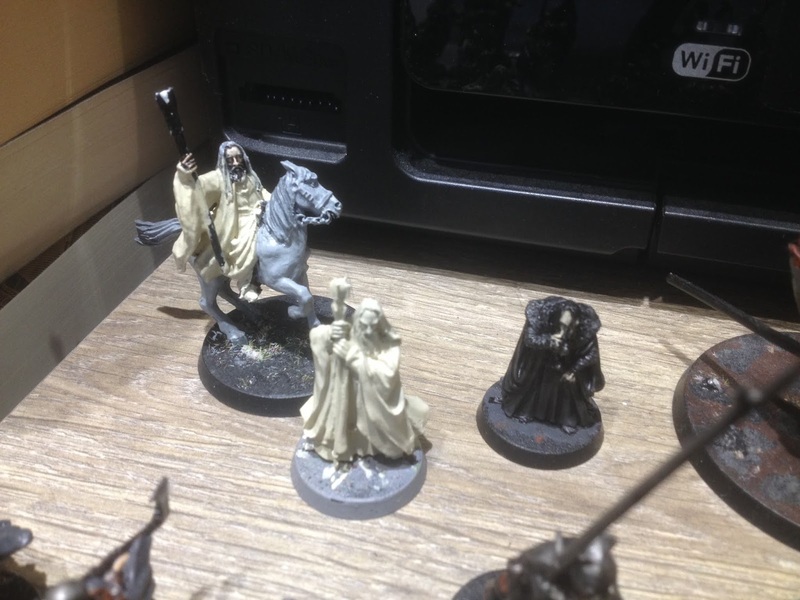 So I went to look at the Nazgul miniatures that would make up the bulk of the force. It was the first time I'd really looked at them in any detail and I found myself really disappointed. So much so, that I felt the need to write a long, rambley post about it on my blog complete with hastily thrown together diagrams. 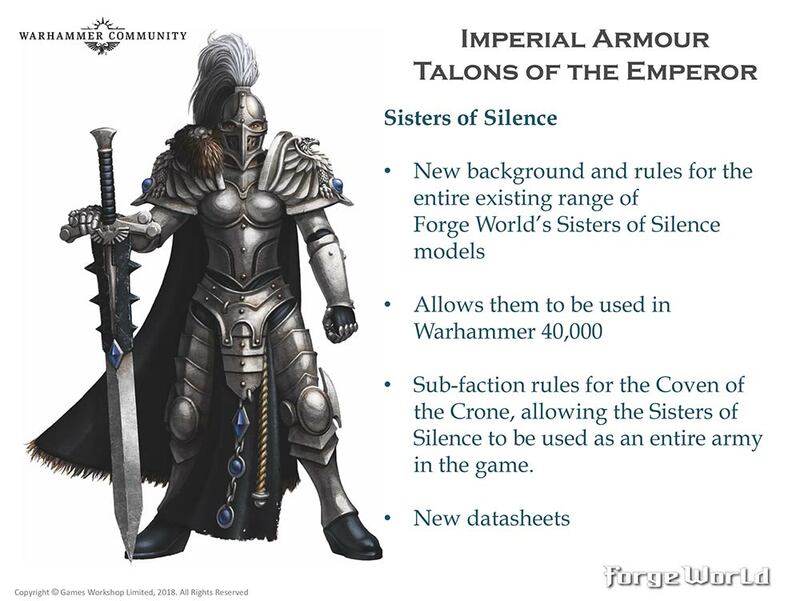 For the first time since I've been at uni (which is getting to be quite a long time now), I've been going along to the wargaming evening that the Tabletop Society runs on a Friday and there has been talk of a possible narrative campaign some time next year using the Inquisitor or Inquisimunda rulesets. 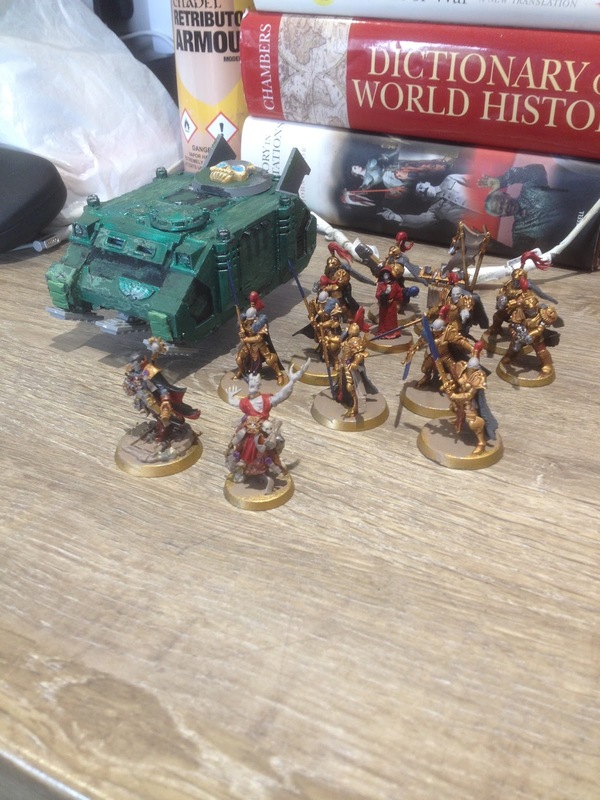 I've never played in a campaign like that before but I've always wanted to really go crazy kit bashing a bespoke little war band for 40k and creating a story with them. Many years ago I had a great time doing something similar with Mordheim and I'm getting that itch again. 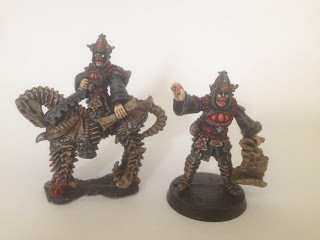 I've long been an admirer of the guys over at Iron Sleet who have churned out some glorious projects over the past few years, The Pilgrym in particular being absolutely stunning and exactly the kind of modelling and gaming experience I'd like to have with some fellow minded hobbyists. I've always been amazed and inspired by the Navigator projects done by weirdingway (Found here on DakkaDakka) which have always made me want to explore the Navigator houses myself in a modelling capacity. Though it may be a while before I have the chance to do some converting, I have started to do some sketches roughing out ideas and thinking about parts I might use to create a unique-looking Navigator war band. Hopefully in the next few months people will start coming together and the campaign can get organised. 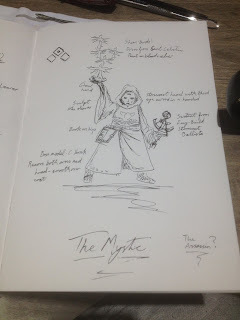 I'm getting rather excited at the prospect of such a project so I really hope it gathers enough interest to take off. Even if it doesn't, I may do some of these conversions anyway as a fun little side piece to the other projects I plan on undertaking next year. 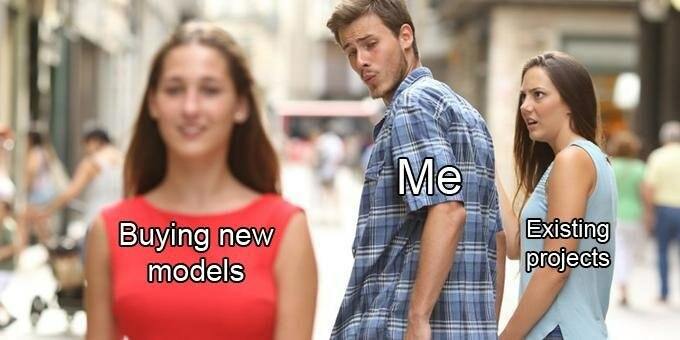 Much like how I briefly worked on a Kill Team alongside my Custodes this year. 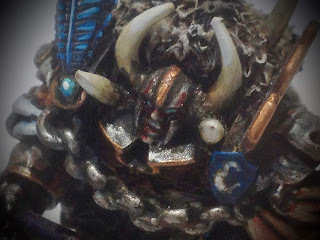 We shall see, if things go ahead I'll make sure to try and document my work and the campaign as best I can on the blog. As I mentioned in a previous post, I've kinda decided to just quit Warmachine now unless Privateer Press really shake things up. 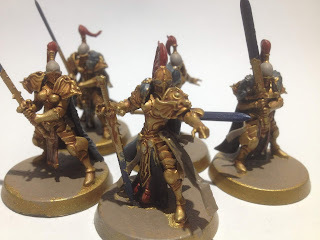 I repainted my army last year after getting a few more things for it, but I found the process of doing so quite draining and not the most enjoyable of hobbying experiences for a number of reasons. In 2016 I tried to renew my interest in the game and had a few battles with my brother, but the Mk3 rules and a new focus on themes didn't really invigorate me. I've just ceased to have any interest in Warmachine at all, and after having having some really great experiences with GW recently as well as getting into Malifaux; I've decided that I'm no longer going to buy new miniatures for Warmachine or try and get games in. This is the first time I've really fallen out of love with a game and its a strange feeling. I think its been a slow process and probably happened a long time before I realised it. I have however decided that I'd like to end on a high note by purchasing and painting two miniatures I've always wanted to get for the faction: the Harbinger of Menoth, and Servath Reznik, the Wrath of Ages. I had more of a preference for the latter so managed to get one cheap on eBay a few months ago. Just the act of assembling Reznik reminded me of nearly all the problems I have with the miniatures themselves. 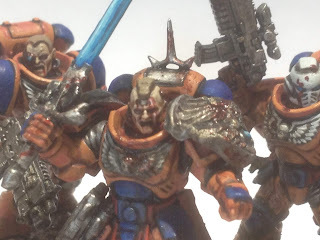 The use of metal, the ungodly combination of metal and resin parts, the weird mould lines, lots of clean-up, the pieces that don't fit together properly, details that aren't as sharp as one might expect... the list goes on and on. After some tribulation I managed to finally get him assembled into sub-assemblies for painting. 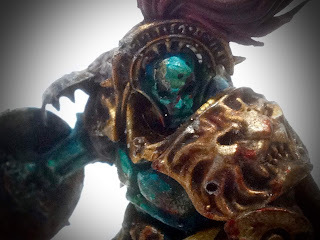 Still though, I live in fear of him shattering into his constituent pieces should I drop him (indeed bits constantly kept dropping off during painting without the need to drop him, and despite all the superglue I used), a fear I'll no doubt share with the all-metal Harbinger. I've elected to paint him like the rest of my army, and he forms a nice centrepiece for that force. 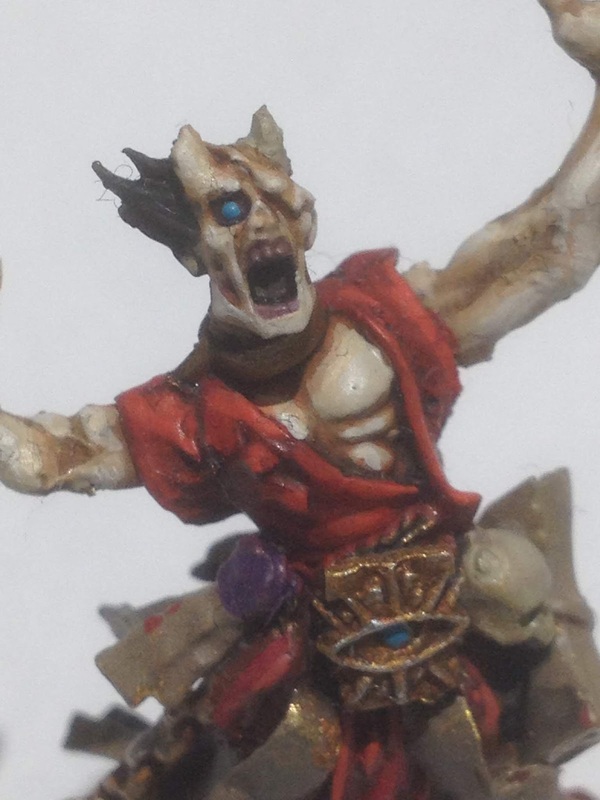 Similar to the other war casters I have painted him in slightly more highlighted colours than the rest of the army but to contrast his lighter blues I've added extra grunge and bloodiness to represent his malevolent character. 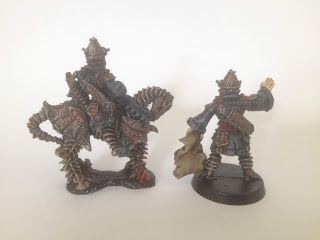 Though this post is quite negative I would like to make it clear that I do quite like the miniature, even if it was a paint to put together. 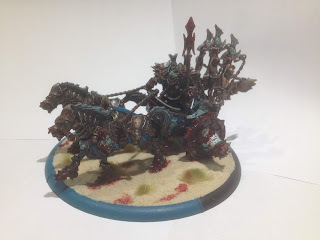 I think its very cool aesthetically and thematically, and I am a sucker for having an army general mounted on a suitably impressive monster or war-engine. 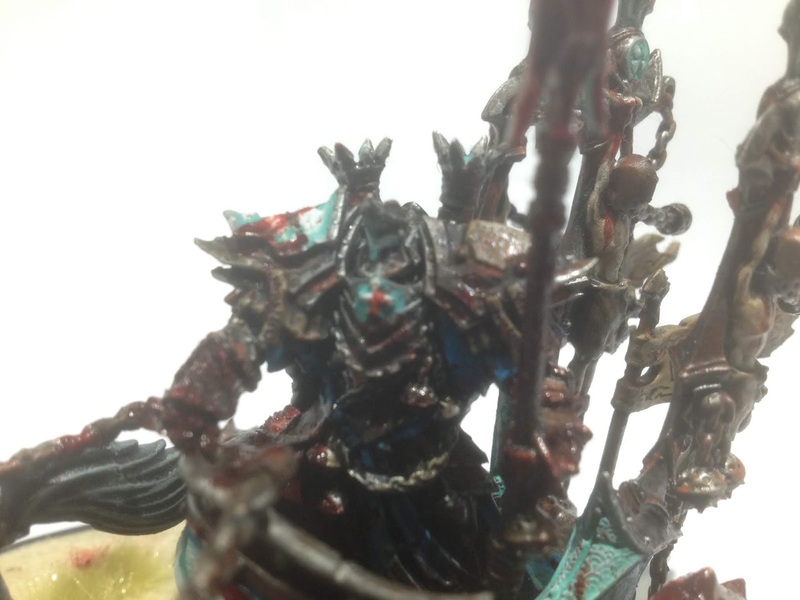 "Build me an army, worthy of Mordor"
Though I began earlier this year working on my Easterlings, the first army I am planning on getting painted up fully is my Isengard force. This is mostly because I'm quite happy with the base colours (it just needs highlights and touching up), I don't need to buy anything else for the force as its around 1000 points already, and Saruman is one of my favourite characters so he kinda gets preferential treatment. 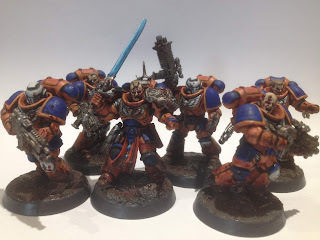 The previous incarnation of this army (with some really awful blurry photos to boot) had a slightly different composition to how it stands now. 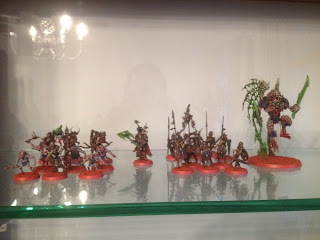 Notably missing is one of the trolls and the unit of orcs which I have moved over to my fledgeling Mordor army. However, I have replaced them with some Uruk-Hai warriors I fixed up, a demolition team I forgot I owned, and a while ago I picked up a version of Saruman on foot and Grima Wormtongue. 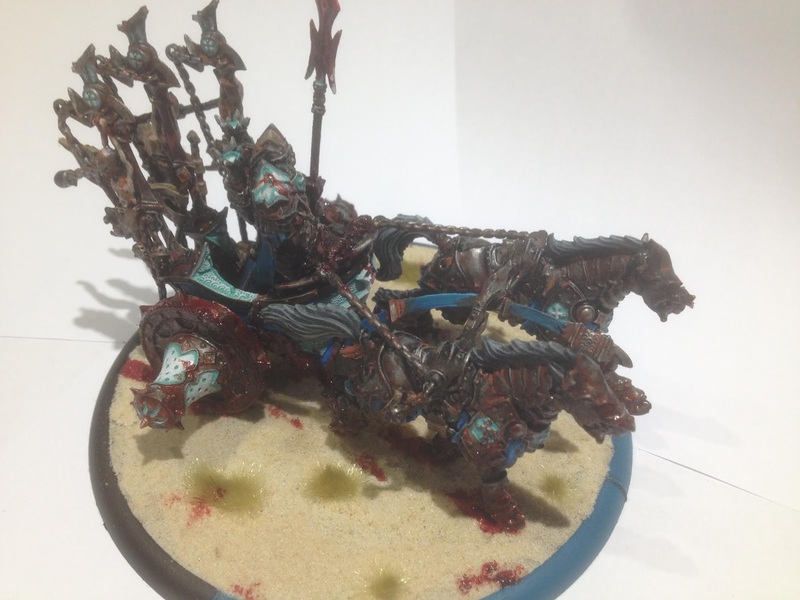 While I have no plans on expanding this force, if I were I'd probably want to add some Warg Riders for cavalry, possibly put some orcs back in there for cheap bodies, and crossbowmen for more shooting. 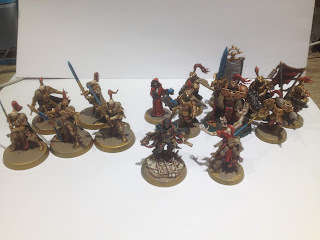 The main things I have done in repainting this army is taking away nearly all the red that was previously there. I wanted to make my Isengard force quite dark and grungy, as well as making it distinct from the other evil armies that come more directly under the thrall of Sauron which will feature red quite predominantly. 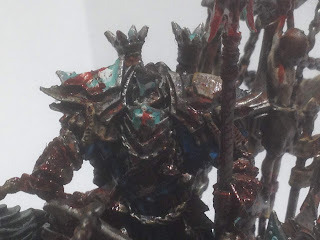 This included removing red from the clothes of my Dunlendings, and repainting the flesh of my Uruk-Hai to remove any reddish tint. The only other big repainting I'm doing is Saruman himself who will be much brighter with less severe shading as I think I can do a much better job at painting him now than five years ago. There's still lots to do in order to achieve the look I'm going for, in particular I will have to spend quite a bit of time working on re-applying white hands to quite a few of the miniatures who previously had them on their faces. However, I'm hoping that this project wont end up taking too much time and I'm aiming to have it finished by Christmas whereafter my Mordor army will become my main focus. 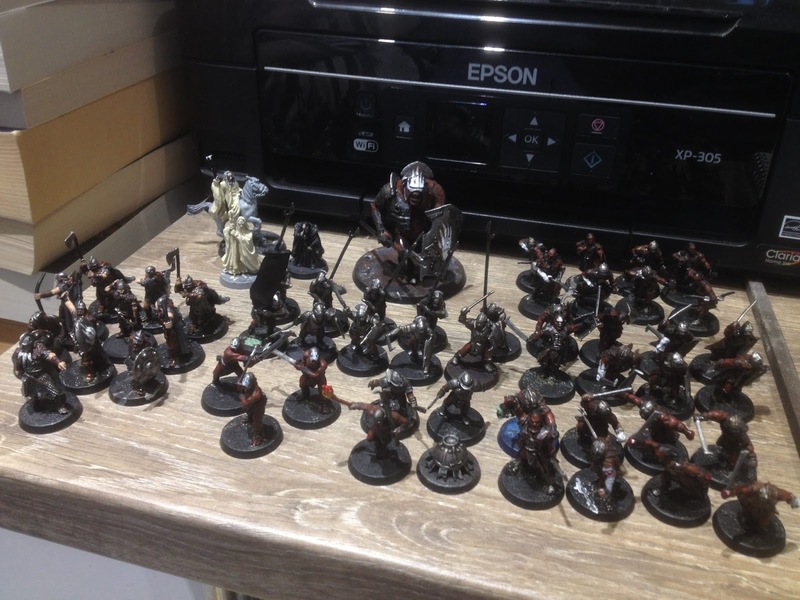 My Mordor force will be comparable in size to my Isengard army but requires much more work. Here's a bonus quick pic of the small Rohan force that I'm cobbling together as well. 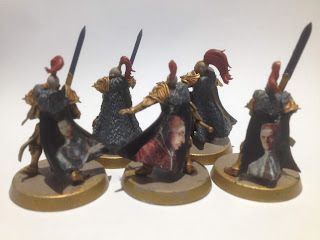 As you can see from the range of different coloured bases, these miniatures have served in quite a few other projects previously and I was actually surprised at how many I was able to pull together for this project. I've got 5 riders, 12 warriors with a decent mix of weapons, 4 royal guard, and hero-wise I've got Eowyn, Merry, and Hama. With the addition of the contents of the Battle of Pelannor Field box and a few more heroes I think this should end up as a solid 1000-ish points force. Non-LOTR stuff is taking up most of my painting time at the moment, but now my Kill Team is finished I hope to really get going on my Isengard and Rohan armies while I finish off my Talons of the Emperor who just need tidying up and basing now. The new Warhammer Conquest part-works subscription thing looks quite interesting. If the armies involved were different and I had more disposable income I'd be somewhat tempted, but instead I just decided to just pick up the first issue because it was only about two pounds and you get three pots of paint and a brush with it which is an absolute steal. I also received a second one as a gift and was then faced with what to do with the six Primaris Marines that came with the issues that I didn't particularly want. 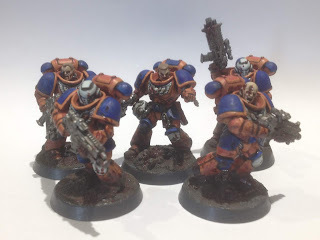 As everyone seems to be raving about the new Kill Team rules, I thought I'd use them to whip up a little team of my own. 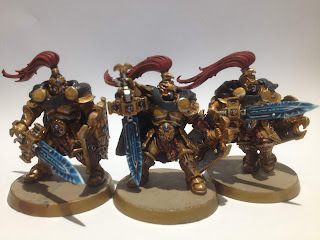 These were quite a fun side project to paint up, despite the fact that I usually hate painting Space Marines and hate doing edge highlighting. 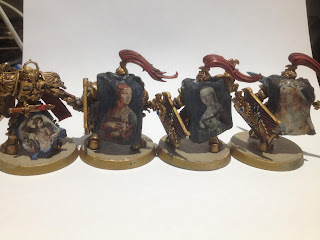 I decided to paint them in colours that I don't use regularly, just as a way to do something very different from what I usually paint. I elected for blue and orange as they are classic contrasting colours and have never really been predominant colours in any of my projects. I have written down all the paints I've used on these miniatures just in case I decide to add more to this little band. Its unlikely, but I must admit that there are a few Primaris miniatures I do like. In fact I'd probably say I am quite a big fan of the Primaris miniatures generally (barring the Repulsor Tank). I'm not a fan of their fluff, but I do like their design quite a lot and I like that scale-wise they embody what Marines are meant to be like in the lore. 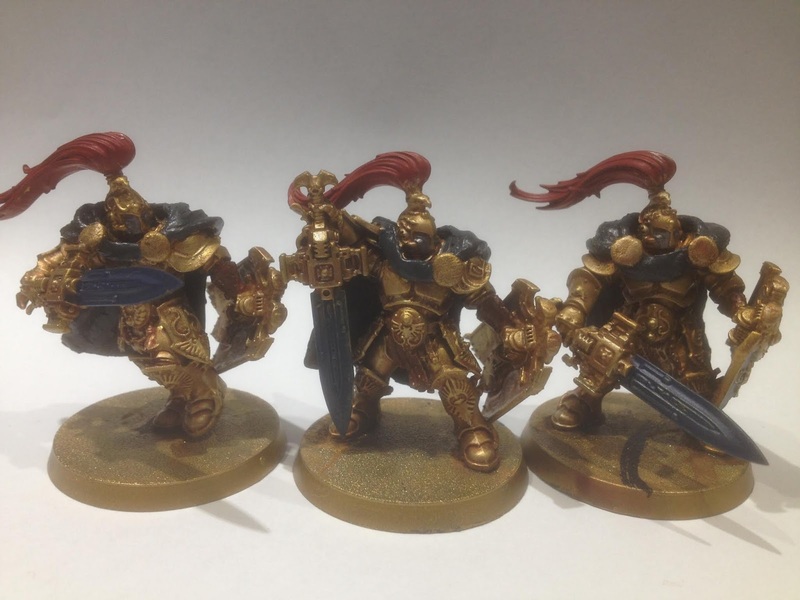 Basing-wise I really wanted to create a contrast between the bright armour, and the grim realities of war. 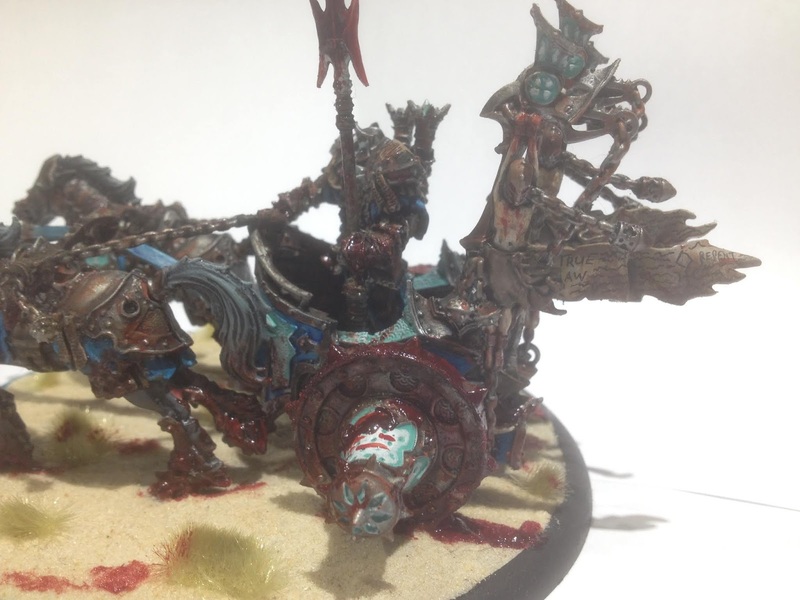 So the bases were subtly decorated with skulls and bones, over which a liberal amount of typhus corrosion was applied to make it look like the marines were wading through a grungy hell-scape. 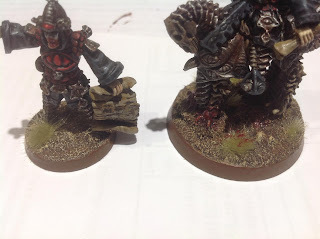 I then applied some crusty-looking blood to the bases and splashed some on the marines themselves (This was a 1:3 mix of Rhinox Hide:Blood for the Blood God), reserving fresher looking blood for any injuries the marines may have sustained themselves. 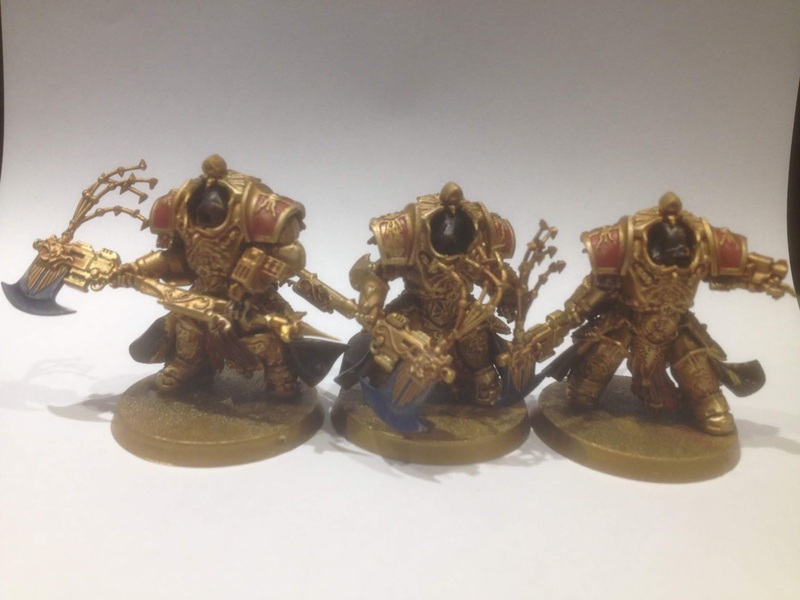 It took minimal conversion work to disguise the fact that I had two sets of the same three miniatures. 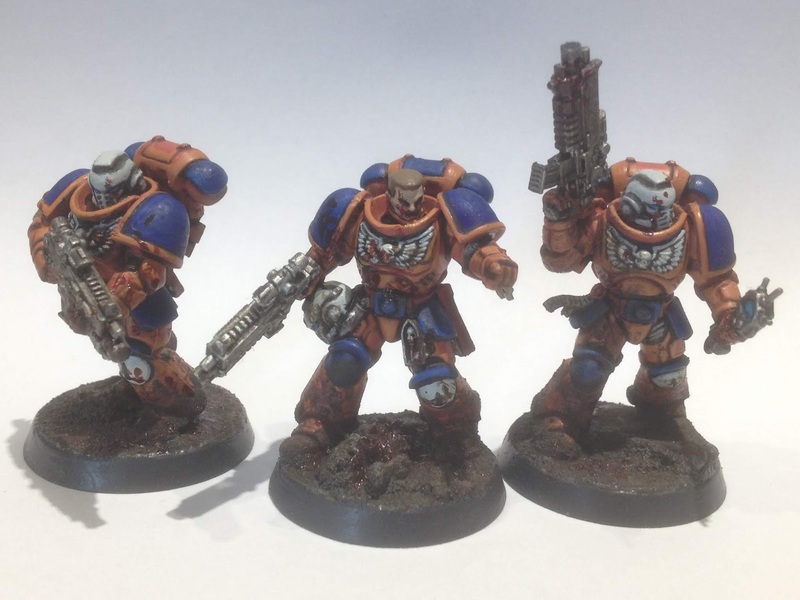 For two of the regular marines; I just removed their purity seals, altered their arm placement and added un-helmeted heads pointing to the other side of their helmeted brethren. 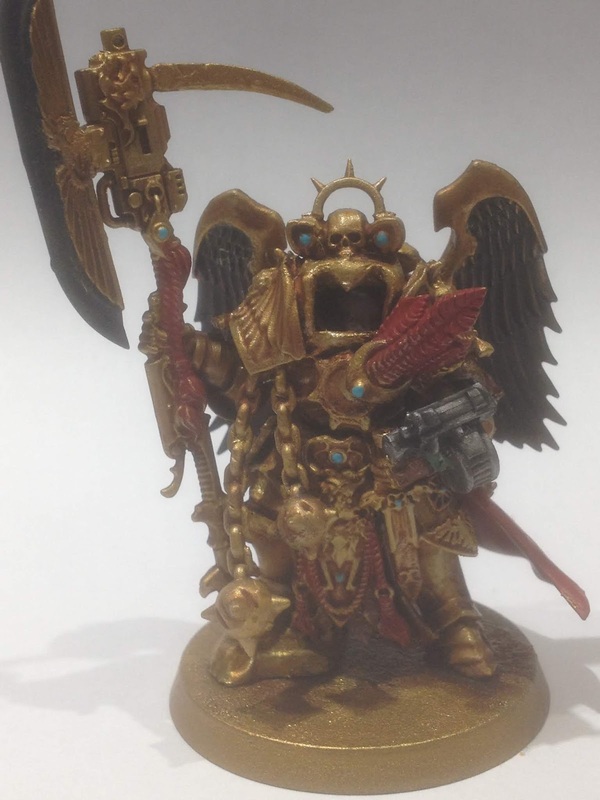 The second sergeant miniature I did more extensive conversion work so I could use him as a potential leader of my Kill Team seeing as in a 'Commander' expansion is coming out. I've also quickly put together an Inquisitorial Interrogator and a Servo-skull to use as objective markers or other game pieces. 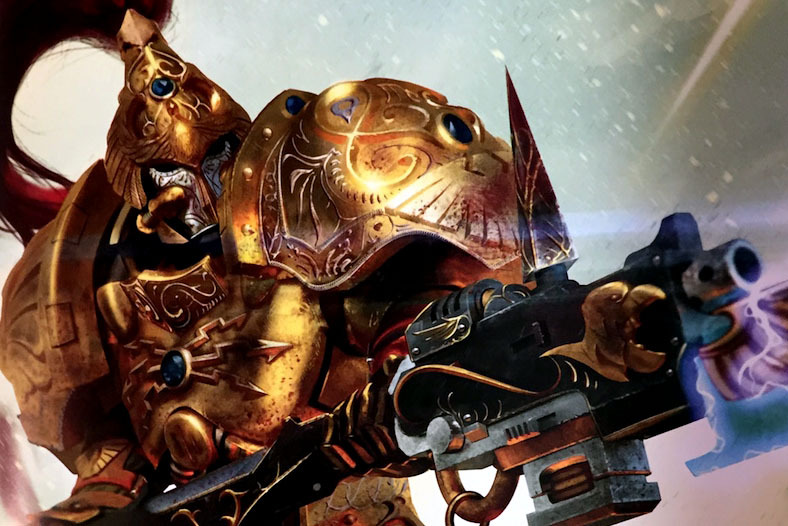 Fluff-wise I think of the Iron-Mongers as Primaris Marines who were requisitioned by the Inquisition to serve as bodyguards and enforcers before they were gifted to a particular chapter. 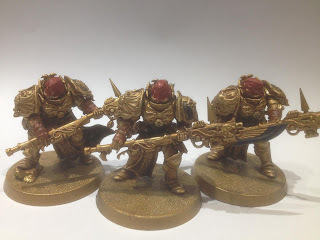 Thus, they've adopted their own unique identity bound to the Inquisition and have been nick-named by other Astartes as the 'Iron Brutes' for their thuggish behaviour and slavish servitude to their Inquisitorial masters. 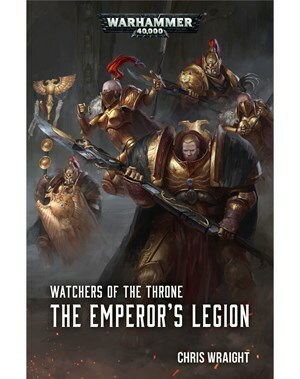 I've always been interested by the Ordo Astartes, a minor ordo of the Inquisition that oversees the Space Marines. 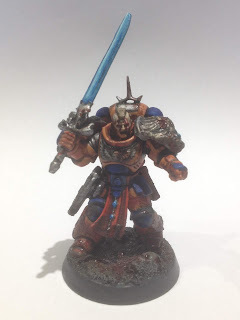 So I've decided that Klaw is a lackey to an Ordo Astartes Inquisitor tasked with ensuring chapters comply with the integration of Primaris marines (especially poignant as most of my regular opponents are likely to be playing Space Marines). 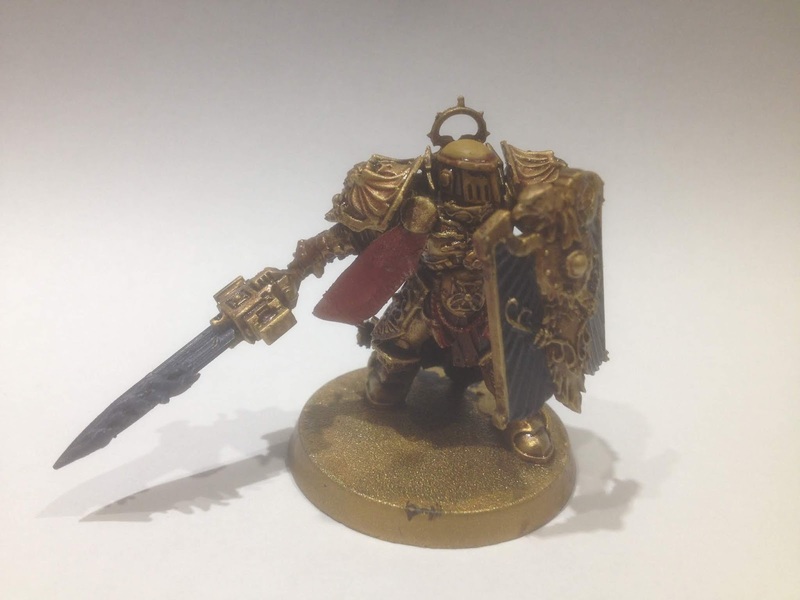 I thought he'd make a good objective marker as perhaps he's gotten lost or separated from him Primaris bodyguards, or needs extracting from a situation gone south. Perhaps one day I'll convert his Inquisitorial master, who knows. 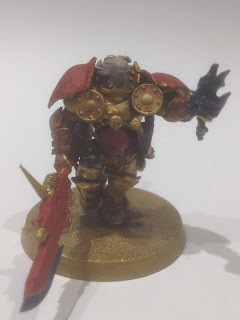 This was only a brief distraction from my Custodes which I'm still plugging away at. In fact I was painting these while I converted a golden dreadnaught for my army, doing edge highlights as I was waiting for pieces to dry. 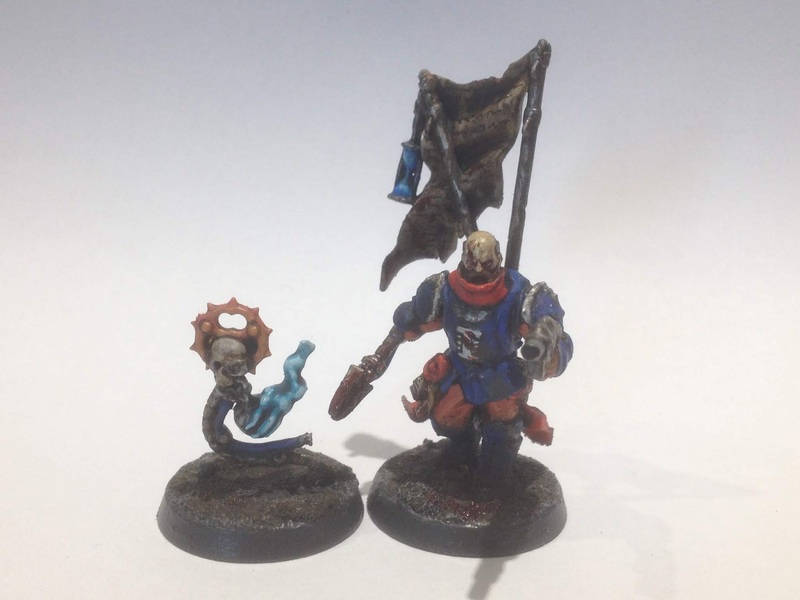 I've no idea if I'll ever actually play any Kill Team, but it will be nice to have some ready miniatures for it (even if grossly unoptimised) should I ever have the chance. 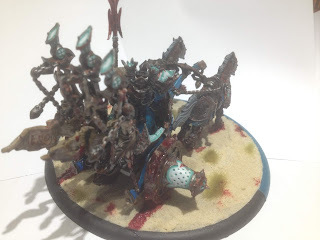 Last year in late autumn I wrote a bit of a rambling post about current things I was working on as well as reflecting upon my progress over the year in relation to the goals I posted back in February. 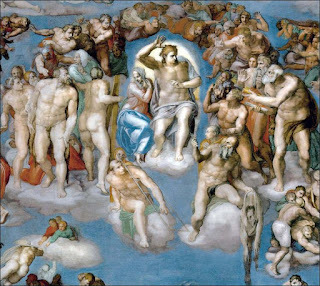 I've got a few odds and ends I'm working on at the moment, and I've started thinking about next year already, so I thought I'd write another rambling post as autumn comes upon us once again. As I mentioned in a previous post, I managed to pick up this old Citadel miniature of the Mouth of Sauron off of eBay which I thought looked pretty cool. He didn't take particularly long to paint up as he is a fairly simple sculpt, but I had an absolute blast doing it. It's got me really excited to start getting into some more miniatures from Middle-Earth! 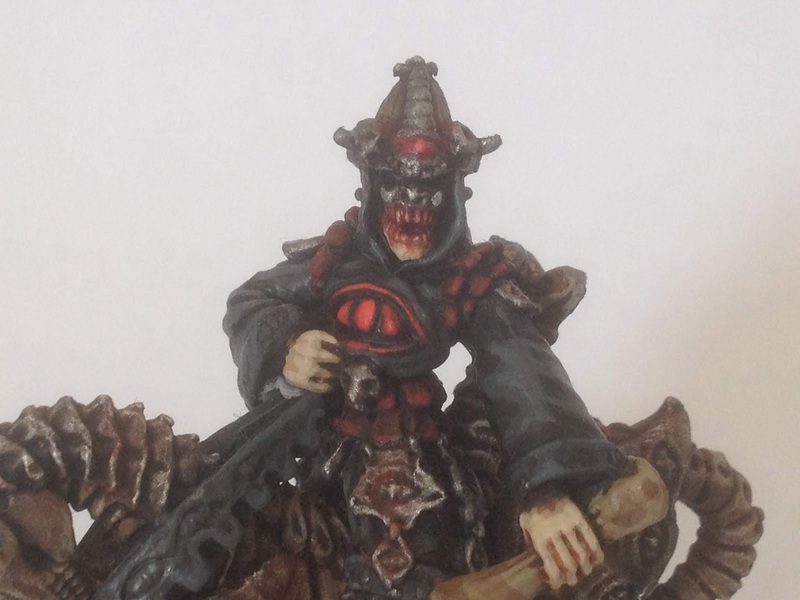 I painted him in fairly muted colours (similar to my Mordor stuff), except for the eyes upon his chest and his helmet to provide both a striking spot colour and to remind his underlings that he speaks with the conviction of the Dark Lord himself. I was surprised to find that the sculpt was of decent quality for its age, though the eye patterning on the fringes of his robes and the bridle of his horse were not particularly well defined so I struggled to do my best at picking them out. There was also text sculpted onto the scroll of the dismounted Mouth, but the detail wasn't great and got lost under a few layers of paint, which allowed me to just write over it. I must also admit I was surprised at how big he is. I was expecting him to be of a weird, smaller scale due to being an older miniature but in reality he seems to more or less at the same scale as modern LOTR miniatures. 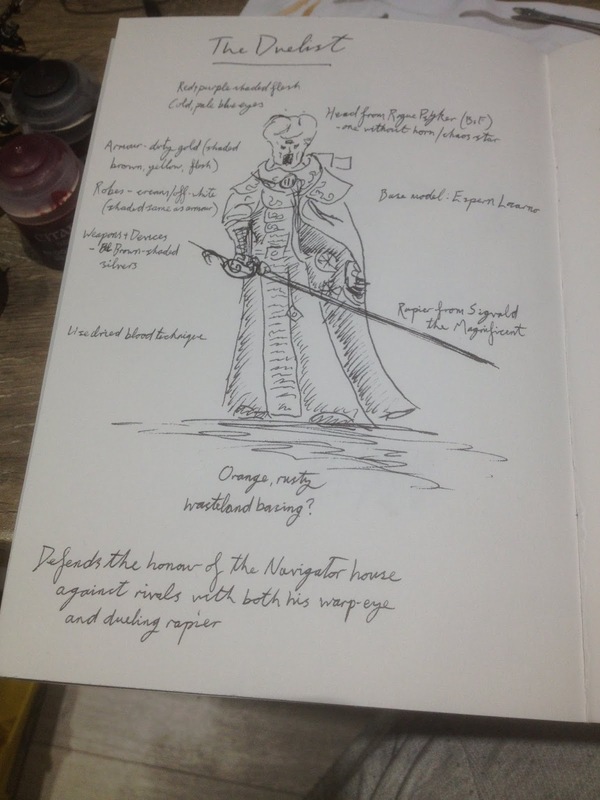 On foot he does appear about the same height as GW's Black Numenorians, so just a bit taller than most men, fitting as the Mouth of Sauron is believed to hail from that race. As I already have a Mouth of Sauron miniature, I like to think of this guy as another, similar emissary of the Dark Lord. In the books at the Council of Elrond, the dwarves reveal that an emissary from Mordor offered them a ring of power in exchange for the location of Bilbo Baggins, and while I think this may have been an early allusion to the Mouth of Sauron himself, it could have been one of a number of Sauron's mortal thralls whose job it is to travel beyond beyond Mordor bearing the word of the Dark Lord. Whether this might be to deliver terms to Sauron's enemies, or to muster armies like the evil men who owe their fealty to Mordor, I like to think of this guy as one of many emissaries of evil to sally forth from Barad-dur in the third age. Consequently I think that I'll use him in game as the Mouth of Sauron, but as an allied unit in other evil armies rather than in my Mordor army itself; to represent him gathering, threatening, and relaying orders to the other dark powers of Middle-Earth. Now that he is finished I'm ready and raring to go with my existing Middle-Earth collections. 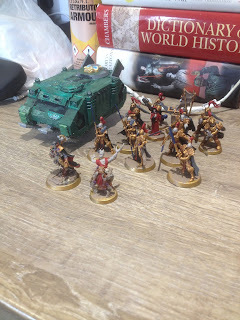 I've taken stock of what I've got and made some plans as to what I'd like to do with it, and I've decided that my first big project will be my 1000 point Isengard force as I don't plan on adding any more miniatures to it. 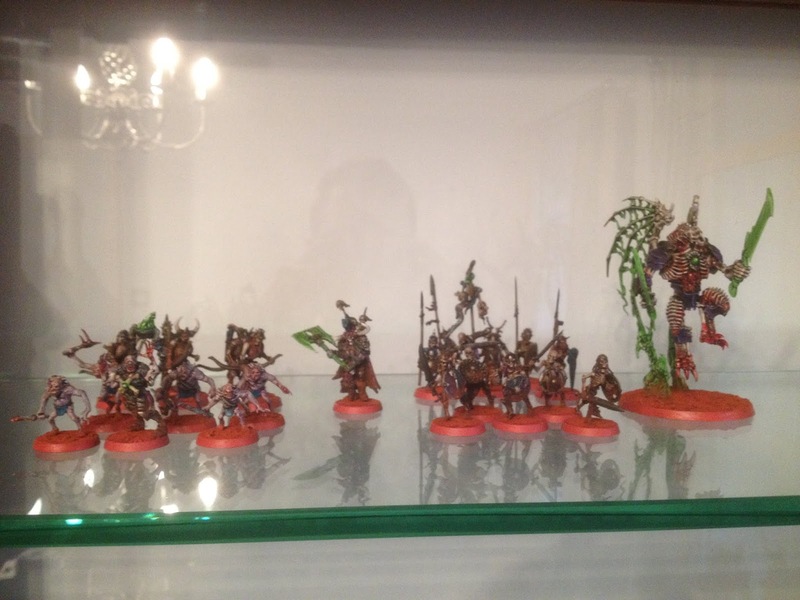 Its as big an army as I think I need and there aren't really any other miniatures in the range I want. 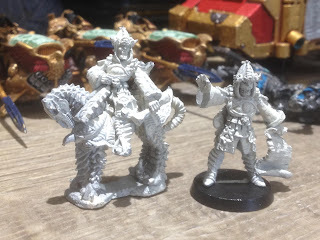 I think I'll also potter around with my Moria and Rohan stuff, laying the foundations for expanding those forces several months down the line, so check back on the blog soon for more Middle-Earth miniatures. 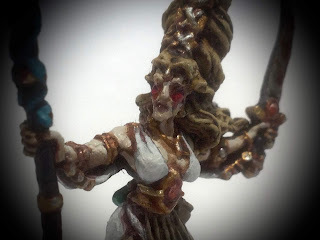 I'm rather excited about GW supporting Lord of the Rings again! It was the game that first got me into the hobby and I'm really looking forward to jumping back in. The lacklustre (and overly expensive) Hobbit releases just didn't do it for me, but the promise of new Lord of the Rings releases has me wanting to gather together my old miniatures and make something of them. As I mentioned earlier in the year, I've decided to work on my LOTR stuff and I think I may see about doing some expanding of my collection as well. I currently have three forces: Isengard, Eastern Kingdoms (Easterlings and Khand), and Harad. These are at about 1000 points each based on the old points costs. 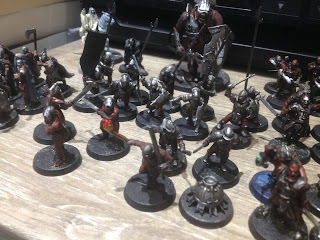 I also think from various spare pieces that I have lying around I could make small (500-750ish points) armies for Rohan, Mordor, Moria, and Angmar as well. 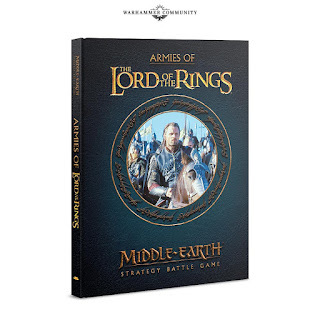 At some point I plan on getting the 'Armies of the Lord of the Rings' book so I can work out what armies can take what units (the GW website has a few oddities like Angmar having Wild Wargs listed but not the Wild Warg Chieftain, and Moria vice versa, so I'm not using that as a reliable source of info), then I'm going to work out what armies I can make from various disparate miniatures I have laying around, write up some army lists, and get painting. 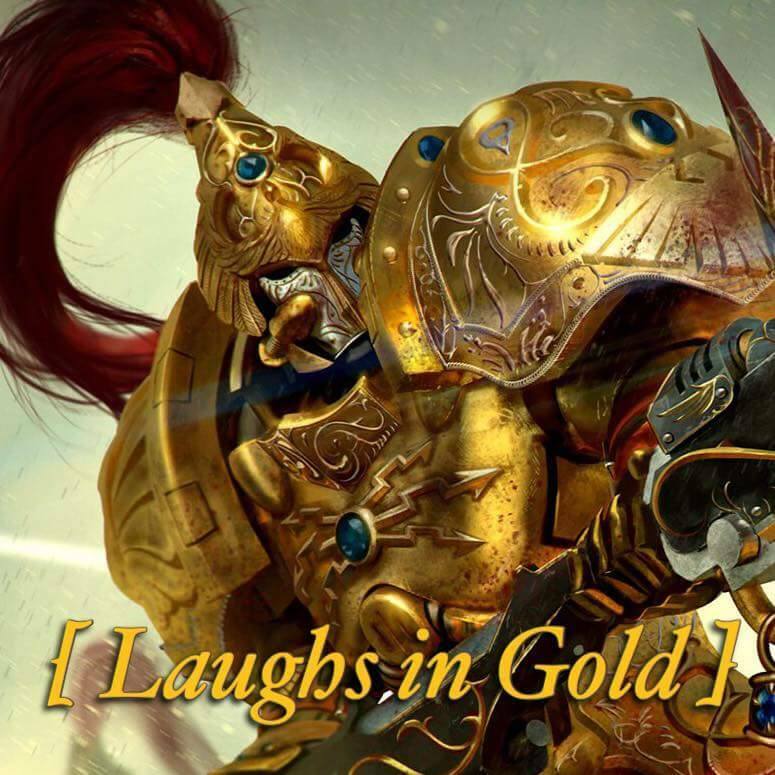 I'm hoping that each force I put together can be a fun, relatively quick project to put together that will give me an excuse to get some of the miniatures I've always wanted to own, paint something different to my Sigmar and 40k stuff, and just dive right back into a world I love! I've got a lot of ideas (probably too many), and I'm very excited to be getting back into this game. 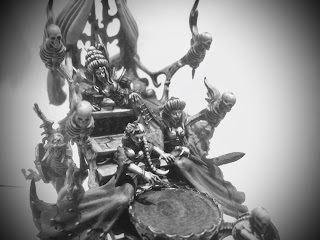 Funnily enough though, I'm not starting off with a new miniature at all. Instead I'm starting with a LOTR miniature produced by GW back in the 1980's. 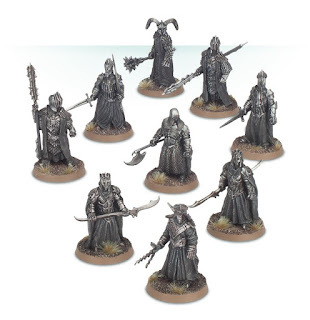 Citadel briefly had a license for LOTR miniatures back then and I'm afraid to say most of them aren't very good, and some are a little odd like a goatee-wearing Elrond. However, I did think that the 1985 Mouth of Sauron was quite charming in an odd way; looking like every sword & sorcery evil wizard mashed together that has then had an eye motif slapped on top of him. He looks kinda hammy and has a skeletal horse, but I quite like it, and I managed to get him fairly cheap off of eBay. 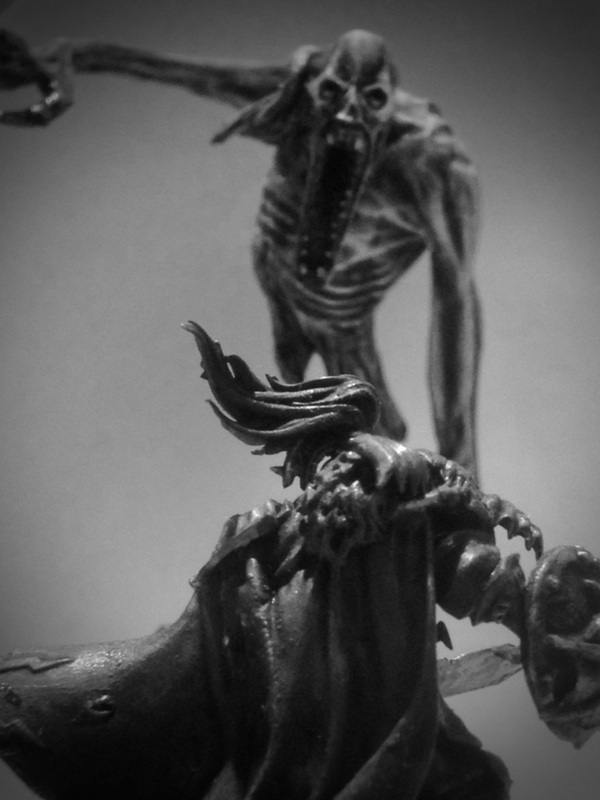 Though I already have a Mouth of Sauron miniature, I just thought this would be a fun side-project to include with my evil forces. 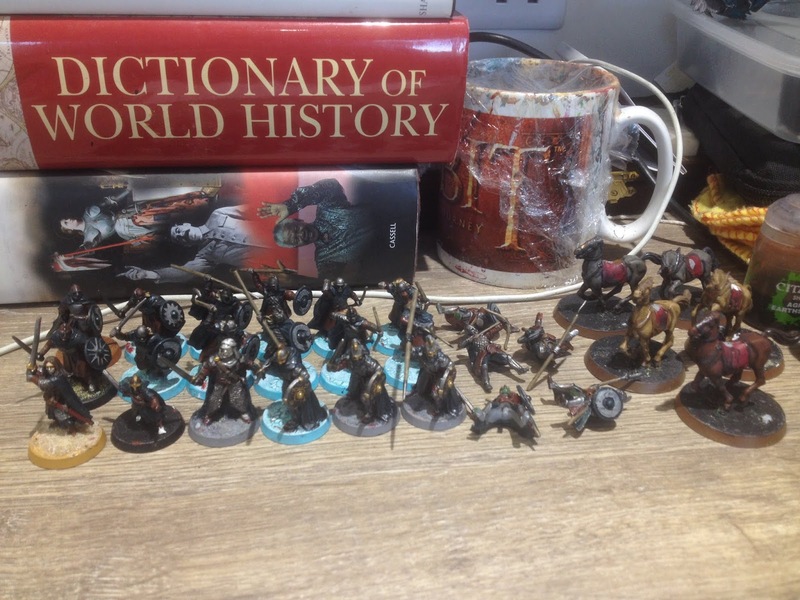 Hopefully I'll soon be visiting my parents, and when I do I'll be able to pick up a force or two to bring back to uni with me so I can get some more progress done on my various LOTR armies. I'll certainly have the time to start indulging in Middle-Earth soon as my Talons of the Emperor are getting closer and closer to being completed. Though LOTR wasn't in my goals for this year (and I doubt its a project I'll wrap up in a year), I am more than happy to put other projects on the back burner, and dive back into a classic game and setting that is very close to my heart. Check back on the blog to see more Middle-Earth goodness soon! 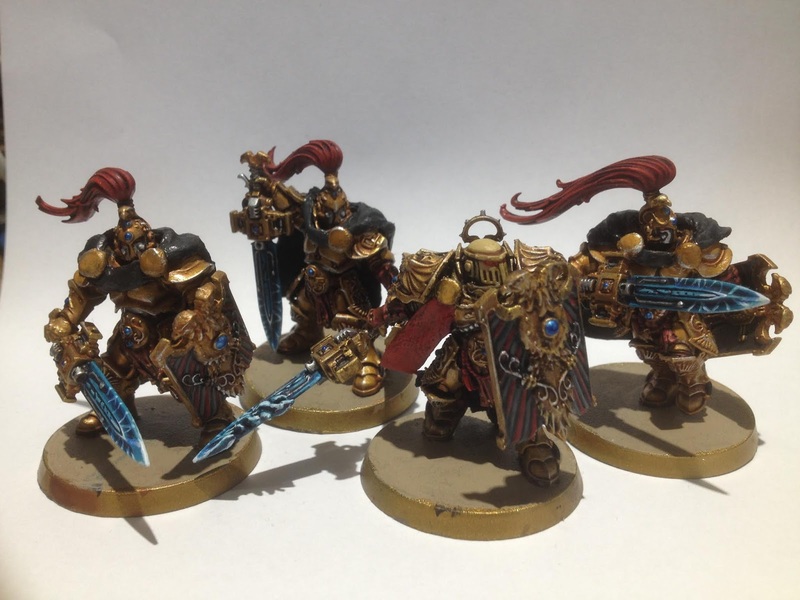 Since my last post in May, I've managed to do quite a bit on the non-Custodes part of my Talons of the Emperor force. Though I've been quite busy, I have been trying hard to make some time to paint and relax amidst everything thats been going on. I've been finding working on my miniatures to be particularly therapeutic, and it's felt rather motivating and rewarding to see a smaller force coming to completion this quickly!